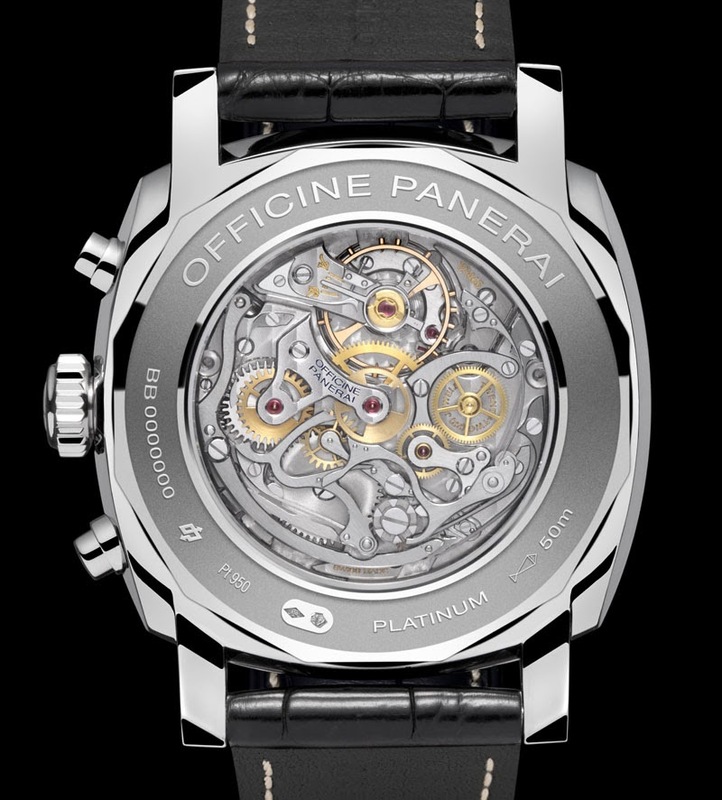 One of the most interesting timepieces from Officine Panerai unveiled at SIHH 2014 is the Radiomir 1940 Chronograph. This is available in three versions in different precious metals, platinum (PAM00518), red gold (PAM00519) and white gold (PAM00520). 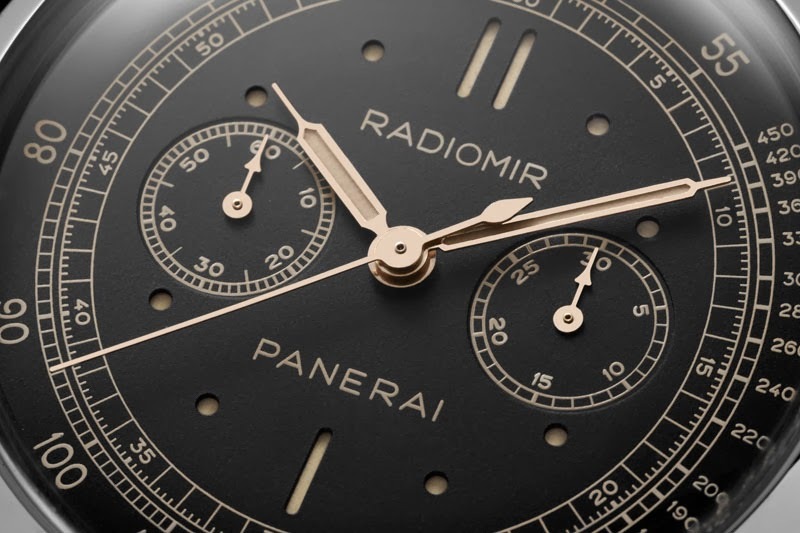 The dial of the new Radiomir 1940 Chronograph is a new and original design, in line with the history of the brand but, at the same time, adapted to the function of the watch. 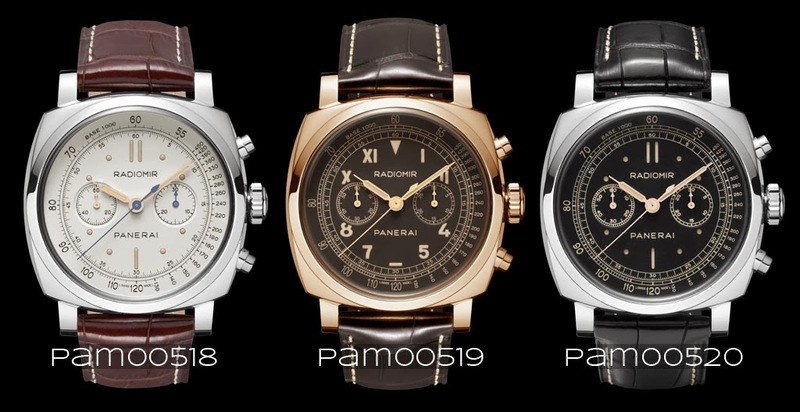 Each model has some subtle variations: the red gold version has a brown dial with the combination of graphic hour markers, Roman and Arabic numerals, a style known by Panerai fans as California, the platinum version has the ivory dial, with simple baton or dot hour markers, and the same design distinguishes the black dial of the white gold version. The latter has a dial with the sandwich structure, formed of two superimposed plates with the luminous material between them, visible through holes corresponding to the hour markers. Common to all three versions is the tachometer scale for calculating average speed and the two chronograph counters. 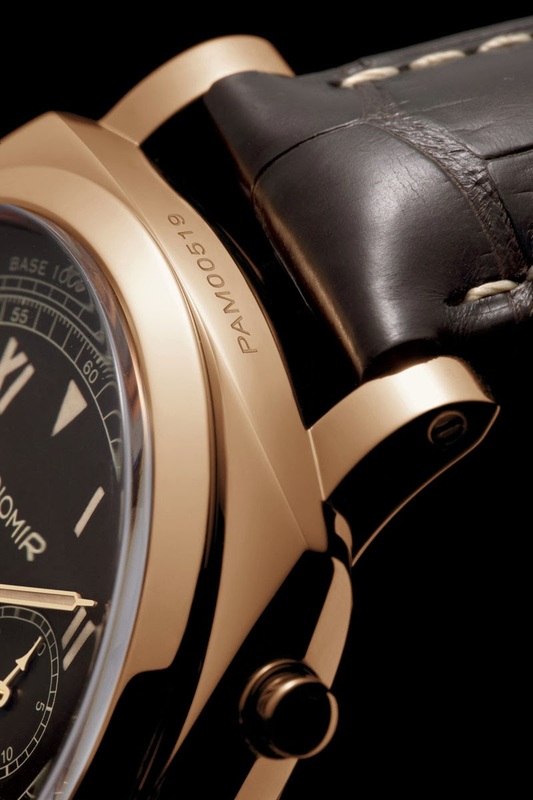 The 45 mm Radiomir 1940 case has polished finish, including the two push-buttons controlling the chronograph functions, the cylindrical winding crown and the bezel which frames a crystal made of Plexiglas, a material similar to that used in the original models created by Panerai for the Royal Italian Navy, which had a polymethyl methacrylate crystal. 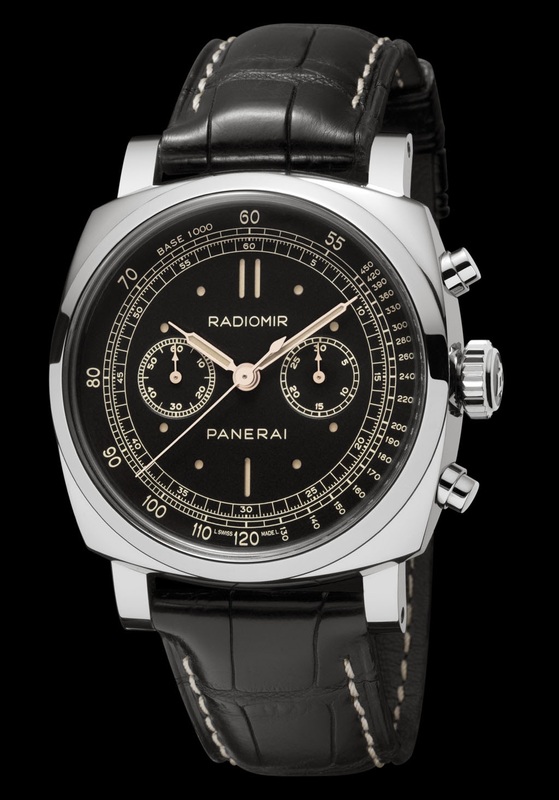 The movement of the new Radiomir 1940 Chronograph is the hand-wound OP XXV calibre, developed on a Minerva 13-22 base. The Minerva manufacture has had historic links with Panerai since the 1920s, when the Swiss manufacturer was a supplier to the Florentine watchmaker. 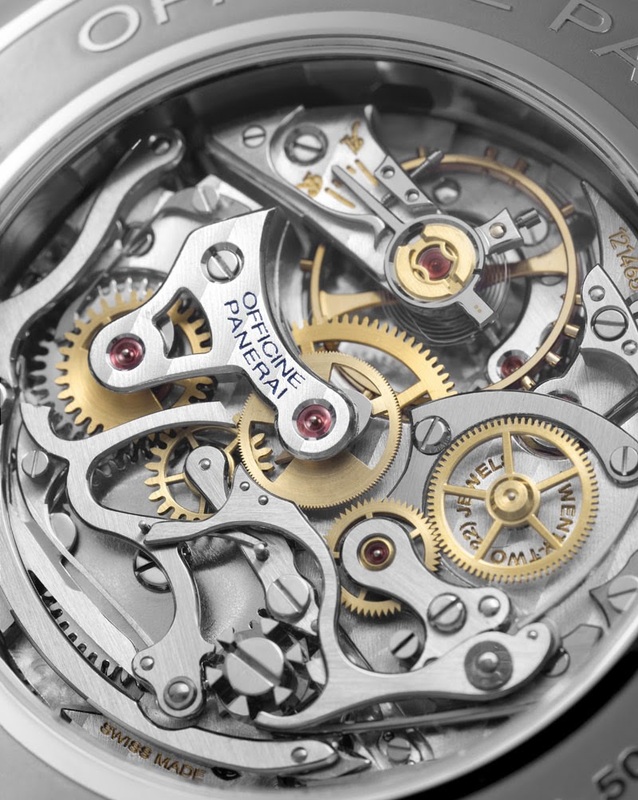 The OP XXV calibre is a hand-wound chronograph with a diameter of 12¾ lignes. 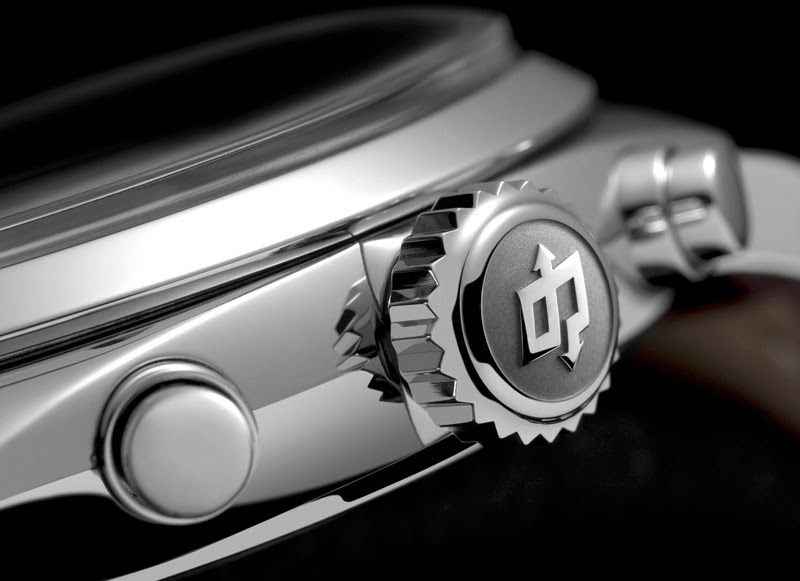 Details such as the column wheel, the swan-neck regulator, the polishing and chamfering of the individual components, and the Côtes de Genève finish of the bridges demonstrate the high quality of this movement which well deserves to be admired through the large sapphire crystal porthole in the back. 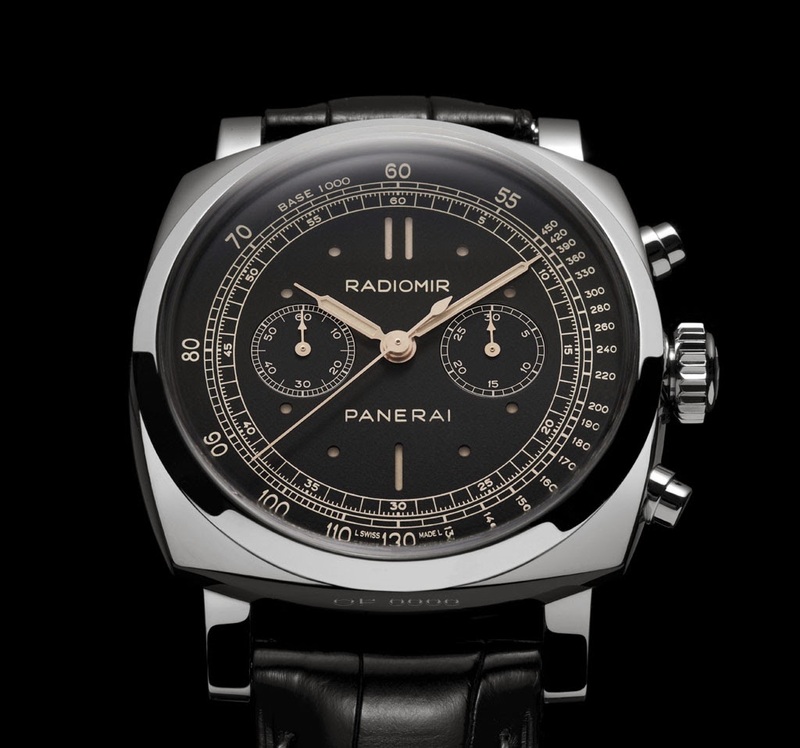 One of the most interesting timepieces from Officine Panerai unveiled at SIHH 2014 is the Radiomir 1940 Chronograph. This is available in three versions in different precious metals, platinum (PAM00518), red gold (PAM00519) and white gold (PAM00520).